Synopsis: A bunch of mermaids discover their talent for putting out fires. Soon they are on call, putting out fires all over town. 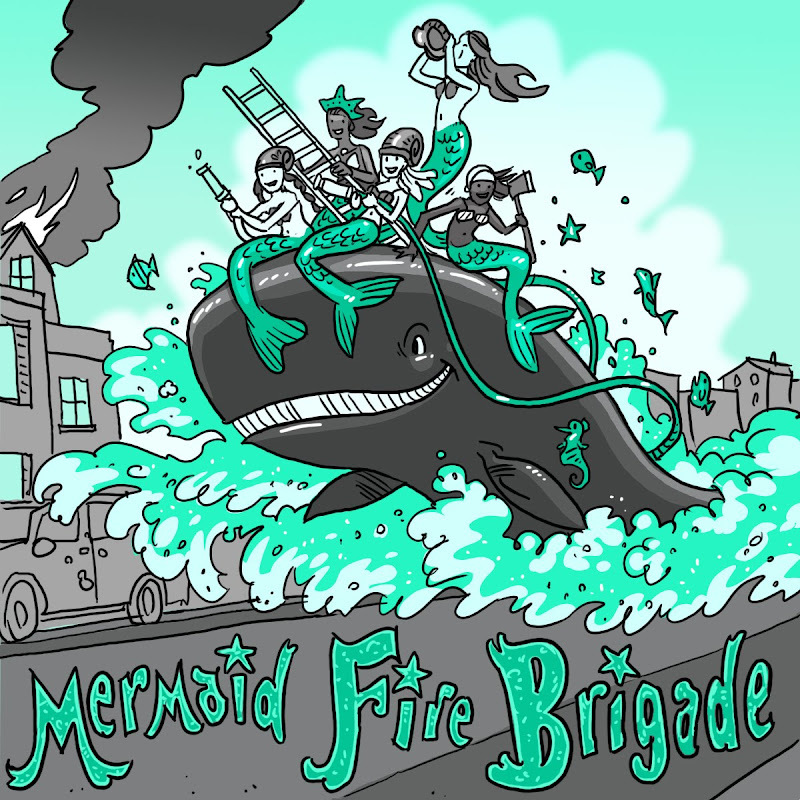 The local fire department worries about keeping busy, will they fight back, join the mermaids, or find something else to do? My four-year-old daughter is crazy for mermaids. We're always checking out mermaid books--I have to say, mermaid life looks pretty boring. You can swim around, comb your hair, maybe pet a dolphin, but that's about it. I thought I'd try something where the mermaids actually do something. I like the idea of mashing fire engines (traditional boy book territory) with mermaids (girl book territory.) I gotta say, out of everything I've done in the marathon so far, this strikes me as the most marketable. Publishers, gimme a call on this baby. Cool idea. Mermaid stories do tend to be boring. 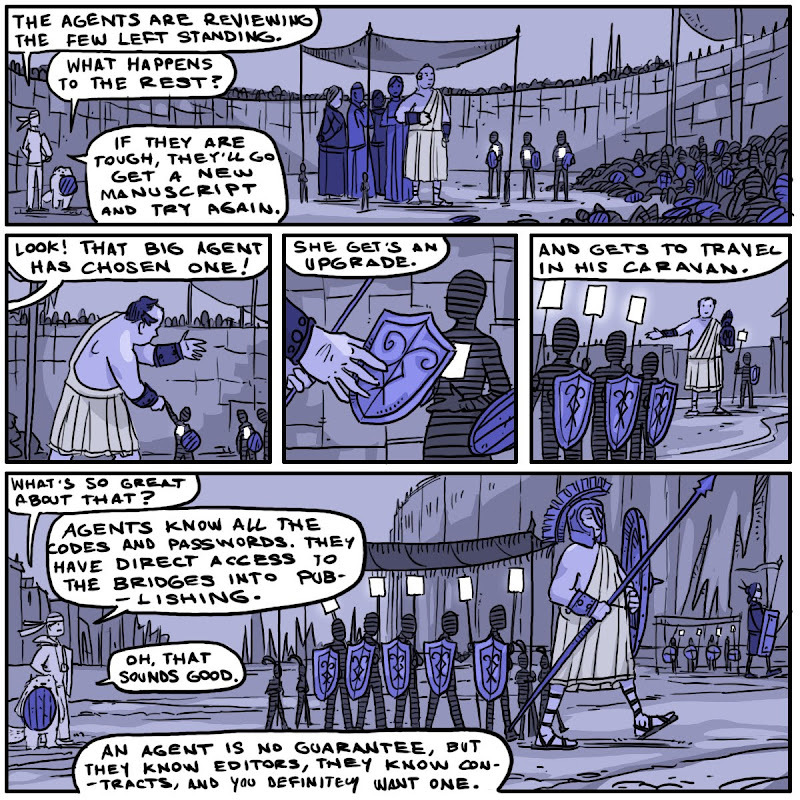 And I love that your agent is huge compared to your writers. You know how I said I was over vampires? NOT SO WITH MERMAIDS. They are the new vampires. I just know it. I worry that the whale will get street burn on his belly. Are there canals, like Venice maybe? I really like the shell helmets. Every girl will want one. Taj would love this book. Can the mermaids use the water from the fire hose as their ladder to go up and save the little girl in the flaming house, or a kitten from a tree? I think this is so fun! Mermaids are silly and kind of awesome. Even more awesome if they are putting out fires. I like the one with the ax the best. I'd love to see her wailing (no pun intended) away at a locked door. We all know that boys secretly love mermaids. I would buy that mermaid book. Really. You should think about doing it. I think it's fantastic (I always had a problem with mermaids and what they did all day too).